This article is about the U.S. Senator from Arizona. For the Florida state senator, see Jeff Flake (Florida politician). Jeffry Lane Flake  (born December 31, 1962) is an American politician who served as a United States Senator from Arizona from 2013 to 2019. A Republican, Flake previously served in the United States House of Representatives from 2001 to 2013. 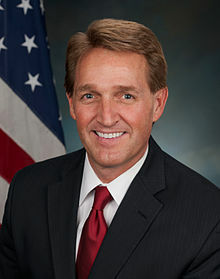 Born in Snowflake, Arizona, Flake attended Brigham Young University, from which he received his Bachelor of Arts degree in international relations, and later his Master of Arts degree in political science. In the early 1980s, he became a missionary for The Church of Jesus Christ of Latter-day Saints in South Africa, where he learned to speak Afrikaans. After returning to the United States, Flake served as Executive Director of the Goldwater Institute, before being elected as a Republican to the House of Representatives from Arizona's 1st congressional district in 2001. He served as the representative for the 1st district until renumbering following the 2000 census redefined the district to be Arizona's 6th congressional district, which he then represented until he entered the Senate in 2013. Flake sought the Republican nomination for the 2012 Senate election after incumbent Jon Kyl announced his retirement. He defeated Democratic candidate and former United States Surgeon General Richard Carmona in the general election. On January 29, 2019, Flake was hired by CBS as a contributor for CBS News. He regularly appears on CBS This Morning and CBS Evening News. Flake was a member of the Liberty Caucus, a group of libertarian-leaning Republican congressmen. He was also a member of the Republican Study Committee. In February 2011, Flake announced that he was running for the U.S. Senate seat being vacated by the retiring Senate Minority Whip Jon Kyl in 2012. Flake easily won the Republican nomination against real estate businessman Wil Cardon. He faced former United States' surgeon general Richard Carmona, who sought office for the first time in the general election. In May 2012, Flake led Carmona by 13 points in the polls. In an October 2012 poll by Public Policy Polling, Flake was trailing Carmona by two points. After the race tightened, the Wall Street Journal criticized a controversial Flake ad that accused Carmona of having "issues with anger, with ethics, and with women." Flake was endorsed by the Casa Grande Dispatch,  the United States Chamber of Commerce,  the Senate Conservatives Fund,  and the Club for Growth. Flake defeated Democratic Richard Carmona 49–46% on November 6, 2012. He won mainly on the strength of carrying Maricopa County, home to Phoenix and 60 percent of the state's population, by 77,200 votes, more than the overall margin of 67,900 votes. He also benefited from Mitt Romney carrying the state by 10 points in the presidential election. Flake succeeded retiring Republican U.S. Senator Jon Kyl on January 3, 2013. Despite Flake's efforts against the bill, however, it was signed in to law by President Barack Obama on December 16, 2014. In October 2017, Flake refused to support Alabama Senate candidate Roy Moore in the December 2017 Senate special election in Alabama. Flake said that he could not support a candidate who believed that Muslims should not be allowed to serve in Congress. After the Washington Post reported in November 2017 that a number of women had accused Moore of having pursued sexual relationships with them or sexually assaulted them when they were teenagers, Flake quickly condemned Moore and said he would prefer that Doug Jones, the Democratic candidate, win the special election instead of Moore. On December 5, 2017, one week before the election, Flake donated $100 to the Jones campaign and posted a tweet which said "Country over Party". Jones ultimately won the election. ^ "Jeff Flake". www.nndb.com. Retrieved November 20, 2017. ^ "Poll: Sanders most popular senator, Flake least". The Hill. January 10, 2019. Retrieved January 24, 2019. ^ "How Jeff Flake Became the Most Unpopular Senator in America". The Atlantic. April 29, 2013. ^ "America's Most and Least Popular Senators". Morning Consult. July 25, 2018. ^ "U.S. Senate: Senators of the 114th Congress". www.senate.gov. Retrieved March 2, 2016. ^ Jeff Flake ancestry, Freepages.genealogy.rootsweb.ancestry.com; retrieved on November 5, 2012. ^ a b c d Schorn, Daniel (February 11, 2009). Rep. Flake On Cutting Congressional Pork. CBS News . ^ Flake, United States Senator Jeff. "About Jeff – United States Senator Jeff Flake". www.flake.senate.gov. Retrieved May 18, 2016. ^ "Rolly: My recollection of events 20 years ago turned out to be a little flaky" Archived March 3, 2016, at the Wayback Machine Salt Lake Tribune. ^ Stone, Andrea (April 12, 2006). "Term-limit pledges get left behind". USA Today. ^ Giblin, Paul. "Flake faces solo race after judge removes hopeful", East Valley Tribune, July 12, 2006. Retrieved 4 September 2018. ^ U.S. House of Representatives / Arizona 06. CNN. Retrieved on November 5, 2012. ^ "The Liberty Committee". Retrieved June 24, 2007. ^ Tang, Layla (February 14, 2011) "U.S. Rep. Flake announces Senate bid", KGUN9-TV. Retrieved 2011-02-14. ^ Zapler, Mike; Isenstadt, Alex (August 29, 2012). "Arizona House primary results: Ben Quayle booted from Congress". Politico. ^ Finley, Allysia (October 5, 2012). "Arizona's Flake Out". Wall Street Journal. Retrieved October 24, 2012. ^ Finley, Allysia (October 15, 2012). "Flake's Flip-Out". Wall Street Journal. Retrieved October 24, 2012. ^ "Editorials: Paton in 1st District". Casa Grande Dispatch. October 8, 2012. Retrieved October 24, 2012. ^ "U.S., Arizona Chambers of Commerce Endorse Jeff Flake for U.S. Senate". Western Free Press. October 10, 2012. Retrieved October 24, 2012. ^ U.S. Senator Jim DeMint, SCF Chairman (April 20, 2012). "Jeff Flake for U.S. Senate". senateconservatives.com. Retrieved October 24, 2017. ^ "Club for Growth PAC Endorses Jeff Flake for Senate". Club For Growth. February 14, 2011. Retrieved October 24, 2012. ^ Phillip, Abby (November 6, 2012). "Jeff Flake Wins Arizona Senate Race". OTUS. ABC News. Retrieved November 14, 2012. ^ Ray, Jordan (September 18, 2014). "Jeff Flake: Send Harry Reid, Mitch McConnell to island". Politico. Retrieved October 16, 2014. ^ a b Martinez, Marc (June 14, 2017). "Senator Jeff Flake recounts baseball practice shooting". KSAZ Fox-10. Retrieved June 15, 2017. ^ Schor, Elana (June 14, 2017). "Obama reaches out to Sen. Flake after shooting". Politico. Retrieved June 15, 2017. ^ a b Nowicki, Dan. "Arizona's Jeff Flake announces he will not seek reelection to the U.S. Senate". AZCentral. Retrieved October 24, 2017. ^ a b Coppins, McKay (October 25, 2017). "The Tragedy of Jeff Flake". The Atlantic. Retrieved October 25, 2017. ^ Cillizza, Chris (October 25, 2017). "Jeff Flake gave the most important speech of 2017". CNN. Retrieved October 25, 2017. ^ CARNEY, JORDAIN (May 7, 2018). "Flake says he'll donate to Manchin if Blankenship wins primary". The Hill. Retrieved May 15, 2018. ^ "Democrat Kyrsten Sinema wins Arizona US Senate seat". AP NEWS. November 13, 2018. Retrieved November 13, 2018. ^ "Jeff Flake blasts Trump, stokes presidential-campaign speculation with N.H. speech". azcentral. Retrieved August 9, 2018. ^ a b "Jeff Flake's Ratings and Endorsements". votesmart.org. ^ Parlapiano, Alicia. "Where Senators Stand on the Health Care Bill". Retrieved August 9, 2018. ^ a b c d "It's gotta be the hair". East Valley Tribune. July 12, 2007. Archived from the original on August 31, 2007. Retrieved August 5, 2007. ^ Novak, Robert (January 24, 2008). "The Pork-as-Usual GOP". The Washington Post. A4. ^ Current Taxpayer Protection Pledge Signers Archived July 25, 2011, at the Wayback Machine. Atr.org. Retrieved on November 5, 2012. ^ "America's Newsroom". 'Fox News'. Youtube.com. Retrieved on November 5, 2012. ^ Rogers, David (June 29, 2006). "Tilting at Appropriations?". The Wall Street Journal. A4. ^ Kelly, Matt (October 17, 2006). "Congressman says earmarks could cost GOP power". USA Today. ^ Lichtblau, Eric (March 11, 2010). " New Earmark Rules Have Lobbyists Scrambling", The New York Times. ^ CARNEY, JORDAIN; ELIS, NIV (September 18, 2018). "Senate approves $854B spending bill". The Hill. Retrieved September 19, 2018. ^ a b Foley, Elise (October 30, 2012). "Jeff Flake Has History Of Voting No On Disaster Bills". Huffington Post. Retrieved August 27, 2017. ^ "Flake votes against $50B Hurricane Katrina relief funding". www.bizjournals.com. Retrieved August 27, 2017. ^ Trump's White House is recruiting primary challengers against Republican Sen. Jeff Flake. Eric Bradner. CNN. 18 July 2017. Accessed 19 July 2017. ^ Flake, Jeff (2017). Conscience of a Conservative: A Rejection of Destructive Politics and a Return to Principle. Random House. ISBN 978-0-399-59291-1. ^ Senior, Jennifer (July 31, 2017). "Republican Senator Jeff Flake Rails Against Trump, but to What End?". The New York Times. ISSN 0362-4331. Retrieved August 2, 2017. ^ Bycoffe, Aaron (January 30, 2017). "Tracking Congress In The Age Of Trump". FiveThirtyEight. Retrieved December 5, 2018. ^ Sullivan, Sean (May 23, 2018). "Republican Sen. Jeff Flake: 'Our presidency has been debased'". Washington Post. ISSN 0190-8286. Retrieved May 24, 2018. ^ a b "Why Trump's GOP critics never go nuclear". POLITICO. Retrieved July 17, 2018. ^ "Senate confirms veteran agent Gina Haspel as first female CIA director despite torture role". USA TODAY. Retrieved November 15, 2018. ^ Breuninger, Kevin (June 28, 2018). "Sen. Jeff Flake says his threat to block judges won't affect Trump's Supreme Court nominee". CNBC. Retrieved July 17, 2018. ^ Flaherty, Joseph (July 17, 2018). "15 Times Jeff Flake Criticized Trump, Then Nothing Happened". Phoenix New Times. Retrieved July 18, 2018. ^ CNN, Jeremy Herb,. "GOP blocks vote on Mueller protection bill". CNN. Retrieved November 15, 2018. ^ "Flake Pledges To Block Committee Votes On Judges — Until Mueller Bill On Senate Floor". NPR.org. Retrieved November 15, 2018. ^ "GOP Sen. Scott opposes Trump judicial nominee Farr, sinking nomination". NBC News. Retrieved November 30, 2018. ^ "US Senate approves Water Rights Settlement Act". The Daily Courier. Prescott, Arizona: Western News&Info, Inc. December 3, 2014. Archived from the original on January 5, 2015. Retrieved January 5, 2015. ^ Rivers, Miranda (September 21, 2014). "House panel asked to approve 'meaningful bill' for Arizona's Bill Williams River". KTAR News. Phoenix, Arizona: Bonneville International. Retrieved January 5, 2015. ^ Heiden, Helen (July 9, 2014). "Four things Arizonans need to know about The Bill Williams River Water Rights Settlement Act". Arizona Chamber of Commerce & Industry. Retrieved January 5, 2015. ^ Heinsius, Ryan (December 8, 2014). "EPA's Proposed Waterways Rule Draws Ire of Arizona's Senators". KNAU Public Radio. Retrieved January 5, 2015. ^ Flake, Jeff (November 14, 2014). "Flake, McCain Call on EPA to Abandon Rule Expanding Water Regs to Arizona's Dry Streambeds". U.S. Senator Jeff Flake. Retrieved January 5, 2015. ^ Flake, Jeff (May 6, 2014). "Flake Calls on EPA to Abandon Proposed "Waters of the U.S." Rule". U.S. Senator Jeff Flake. Retrieved January 5, 2015. ^ "Proposed EPA rule could hurt Arizona's water supply". Editorial. The Arizona Republic. May 27, 2014. Retrieved January 5, 2015. ^ "FURTHER CONSIDERATION OF H. RES. 114, AUTHORIZATION FOR USE OF MILITARY FORCE AGAINST IRAQ RESOLUTION OF 2002". Congressional Record Volume 148, Number 131. October 8, 2002. Retrieved August 26, 2018. ^ French, Lauren (December 20, 2014). "Obama's Republican ally on Cuba". Politico. Retrieved December 22, 2014. ^ Moore, Tina (April 19, 2013). "Arizona senator told mother of theater shooting victim that he supported gun background checks, then voted against them". New York Daily News. Retrieved April 23, 2013. ^ Memoli, Mike (April 18, 2013). "Twitter". Retrieved April 30, 2013. ^ Memoli, Michael A. (April 18, 2013). "Senate sets aside gun bill, for now". Los Angeles Times. Retrieved June 3, 2013. ^ Abad-Santos, Alexander (April 29, 2013). "How Jeff Flake Became the Most Unpopular Senator in America". The Atlantic Wire. Retrieved April 30, 2013. ^ Bunis, Dena (March 21, 2007). "Legalization path planned". Orange County Register. Retrieved August 31, 2012. ^ Articles – Inside Report: Democratic Discipline. RealClearPolitics (January 13, 2007). Retrieved on 2012-11-05. ^ "Our Opinion: Capsule comments – Tucson Citizen Morgue, Part 1 (2006–2009)". tucsoncitizen.com. Retrieved November 20, 2017. ^ H-1B bill seeks to 'staple' green cards to PhDs. Siliconindia.com (April 7, 2009). Retrieved on 2012-11-05. ^ STAPLE Act (2009; 111th Congress H.R. 1791). GovTrack.us. Retrieved on November 5, 2012. ^ STAPLE Act (H.R. 399). GovTrack.us. Retrieved on November 5, 2012. ^ Freking, Kevin. "Democratic candidates pitch DREAM Act for platform". sandiegouniontribune.com. Associated Press. Retrieved September 4, 2017. ^ "Career politician Jeff Flake reversed his position on the DREAM Act; after he voted against the DREAM in December 2010". Tucsoncitizen.com. October 29, 2012. Archived from the original on February 5, 2013. Retrieved November 5, 2012. ^ O'Keefe, Ed (June 24, 2014). "Q&A with Jeff Flake on immigration: 'Citizenship ought to be earned and valued'". The Fix. The Washington Post. Retrieved December 7, 2014. ^ a b McLaughlin, Seth (July 10, 2014). "Jeff Flake: House should have passed Senate immigration bill". Washington Times. Retrieved December 7, 2014. ^ Benen, Steve (November 20, 2014). "The easiest immigration solution is also the best". The Maddow Blog. MSNBC. Retrieved December 7, 2014. ^ Kapur, Sahil. "Jeff Flake: Don't Shut Down Gov't Over Immigration, Pass Reform Instead". Talking Points Memo. November 19, 2014. ^ a b Page, Susan (June 25, 2014). "A year later, bright hopes quashed on immigration". USA Today. Retrieved December 7, 2014. ^ Alman, Ashley (April 21, 2014). "Jeff Flake Shows Support For Jeb Bush's 'Act Of Love' Immigration Comment". Politics. Huffington Post. Retrieved December 6, 2014. ^ Blake, Aaron (January 29, 2017). "Coffman, Gardner join Republicans against President Trump's travel ban; here's where the rest stand". Denver Post. Retrieved January 30, 2017. ^ Feldman, Dan (November 5, 2015). "NBC Sports: John McCain-Jeff Flake report: At least seven NBA teams accepted 'paid patriotism'". NBC Sports. Retrieved March 2, 2016. ^ "Flake and McCain Expose Paid Patriotism at Pro Sporting Events in New Government Oversight Report". Office of U.S. Senator Jeff Flake. November 4, 2015. Retrieved March 2, 2016. ^ a b c Thomsen, Jacqueline (November 13, 2017). "Flake: I'll support the Democrat over Moore in Alabama Senate race". TheHill. Retrieved December 5, 2017. ^ Anapol, Avery (December 5, 2017). "Flake donates $100 to Doug Jones campaign: 'Country over Party'". TheHill. Retrieved December 5, 2017. ^ "The 10 Best Members of Congress," Esquire Magazine. October 2008. Esquire.com. Retrieved on November 5, 2012. ^ H. R. 3199. One Hundred Ninth Congress of the United States of America. gpo.gov. Retrieved on November 5, 2012. ^ USA PATRIOT Improvement and Reauthorization Act of 2005 (2006; 109th Congress H.R. 3199). GovTrack.us. Retrieved on November 5, 2012. ^ USA PATRIOT Improvement and Reauthorization Act of 2005: A Legal Analysis. (PDF) . Retrieved on November 5, 2012. ^ Sensenbrenner Feels 'Betrayed' by FBI's Patriot Act Violations Archived March 3, 2016, at the Wayback Machine. Main Justice (April 14, 2010). Retrieved on 2012-11-05. ^ Chaitin, Daniel (March 8, 2017). "Sen. Jeff Flake introduces bill to kill Obama-era FCC Internet privacy rules". Washington Examiner. MediaDC. Retrieved March 8, 2017. ^ Lauren Phillips (October 2012). "Candidates in tight races disavow Indiana candidate's abortion remark". Dallas News. Retrieved December 24, 2016. ^ Geidner, Chris (December 15, 2010). House Passes DADT Repeal Bill Archived October 21, 2013, at the Wayback Machine, Metro Weekly. ^ House Vote 638 – Repeals 'Don't Ask, Don't Tell' Archived January 18, 2016, at the Wayback Machine, New York Times (December 15, 2010). ^ Campaign, Human Rights. "Congressional Scorecard | Human Rights Campaign". Human Rights Campaign. Retrieved March 19, 2018. ^ Clerk of the House (September 30, 2004). "Final Vote Results For Roll Call 484". United States House of Representatives. Retrieved February 14, 2011. ^ Clerk of the House (July 18, 2006). "Final Vote Results For Roll Call 378". United States House of Representatives. Retrieved February 14, 2011. ^ Parlapiano, Alicia; Andrews, Wilson; Lee, Jasmine C.; Shorey, Rachel (July 28, 2017). "How Each Senator Voted on Obamacare Repeal Proposals". The New York Times. Retrieved October 25, 2017. ^ "Jeff Flake Opposes Discrimination Against LGB (But Not T) People". Huffington Post. November 4, 2013. ^ Senate Passes ENDA in Bipartisan Vote U.S. News and World Report. 7 November 2013. ^ "Cosponsors – S.3032 – 115th Congress (2017–2018): STATES Act". www.congress.gov. June 7, 2018. Retrieved July 7, 2018. ^ Bendery, Jennifer (May 9, 2016). "GOP Senator: If We Lose In November, We Should Confirm Merrick Garland". Huffington Post. The Huffington Post. Retrieved June 8, 2016. ^ Parlapiano, Wilson Andrews, Audrey Carlsen, Jasmine C. Lee, Alicia; Singhvi, Anjali (April 6, 2017). "How Senators Voted on the Gorsuch Filibuster and the Nuclear Option". The New York Times. ISSN 0362-4331. Retrieved April 6, 2017. ^ "Arizona senators go 'nuclear' with GOP, pave way for Gorsuch vote | Cronkite News". Cronkite News – Arizona PBS. April 6, 2017. Retrieved April 7, 2017. ^ Rowland, Geoffrey (September 28, 2018). "Flake says he will vote to confirm Kavanaugh". TheHill. Retrieved September 28, 2018. ^ "Flake confronted by two female protesters after announcing he'll back Kavanaugh". CNN. September 28, 2018. Retrieved September 28, 2018. ^ "Jeff Flake says he will vote for Supreme Court nominee Brett Kavanaugh". NBC News. Retrieved September 28, 2018. ^ a b McLeod, Paul (September 28, 2018). "Trump Has Ordered An FBI Investigation Of The Sexual Assault Allegations Against Brett Kavanaugh". BuzzFeedNews.com. Retrieved September 28, 2018. ^ Peterson, Kristina; Andrews, Natalie (September 28, 2018). "Kavanaugh Nomination Advances to Full Senate With One-Week Delay". Wall Street Journal. ISSN 0099-9660. Retrieved September 28, 2018. ^ "GOP releases summary of FBI report on Kavanaugh: 'No corroboration of the allegations'". ^ https://www.facebook.com/pages/Ed-OKeefe/147995121918931. "Jeff Flake on running for president in 2020: 'I have not ruled it out'". Washington Post. ^ Barr, Jeremy (January 29, 2019). "Former Sen. Jeff Flake Joins CBS News as Contributor". The Hollywood Reporter. Retrieved January 29, 2019. ^ Rojas, Warren; Rojas, Warren (June 8, 2015). "Alexis Flake May Be Congressional Baseball's Biggest Fan". Roll Call – via www.rollcall.com. ^ Lynch, Michael W. (February 2001). Reason Magazine, Soundbite: The Missionary's Positions Consulted on July 28, 2007. ^ Reid, Betty (June 8, 2008). "State Senator Jake Flake dies at Snowflake home". The Arizona Republic. Retrieved February 14, 2011. ^ Flake, Jeff (October 12, 2009). "1 Rep., 1 Week, 1 Deserted Island". The Washington Post. Archived from the original on October 21, 2013. Retrieved June 4, 2013. ^ O'Keefe, Ed (June 2, 2013). "1 Senator, 2 Sons, 4 Days, 1 Deserted Island: Jeff Flake Escapes Again to the South Pacific". The Washington Post. Retrieved June 4, 2013. ^ a b "Election Statistics". Office of the Clerk of the House of Representatives. Retrieved January 10, 2008. ^ Hohmann, James; Deppisch, Breanne; Greve, Joanie (August 2, 2017). "The Daily 202: Jeff Flake delivers the most courageous conservative rebuttal of Trumpism yet". The Washington Post. Retrieved August 17, 2017. Wikimedia Commons has media related to Jeff Flake.